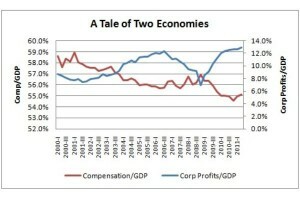 Corporate profits have not only recovered their post-recession highs, they’ve surpassed it. Yet workers' wages are reaching new lows. 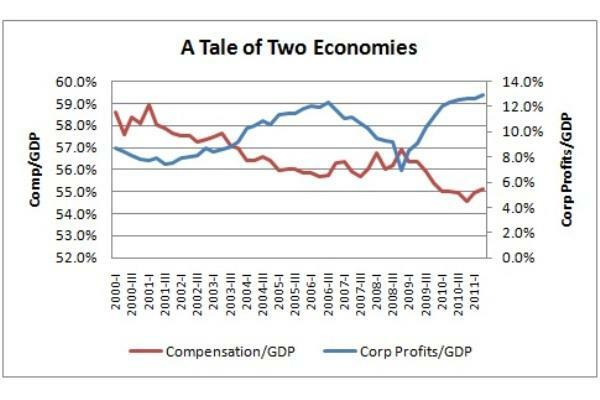 As you can see, corporate profits have not only recovered their post-recession highs, they’ve surpassed it. 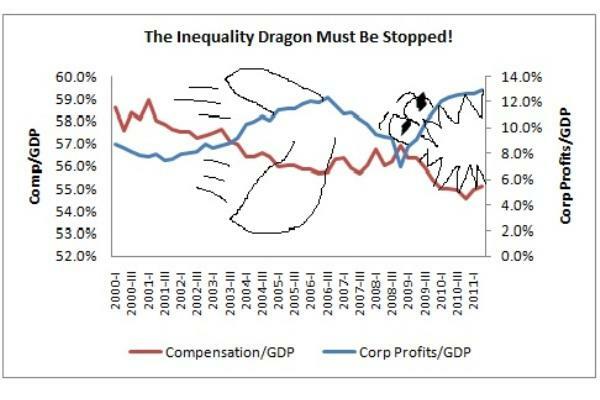 And compensation as a share of the economy is far lower. You can also compare how different these patterns look compared to last recession in 2001, when the income shifts were not nearly so sharp. It’s truly a picture of two very different economies, one for those who depend on their paychecks and one for those who depend on their portfolios. This would be funny except this is NOT a fairy tale. This is one real dragon that does exist and needs to be slayed or it will eat us all. Update: here’s the runner-up graph. It breaks down the “We’re Broke” lie. 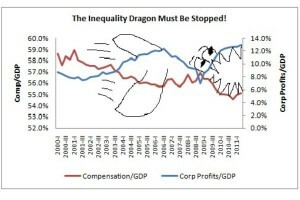 This entry was posted in Featured Story, National News and tagged best graphs, corporations, Ed Show, Ezra Klein, inequality, Occupy Wall Street, pay, salaries, Washington Post. Bookmark the permalink. « Occupy ICE debuts in Los Angeles. Immigrants Occupy in NY.